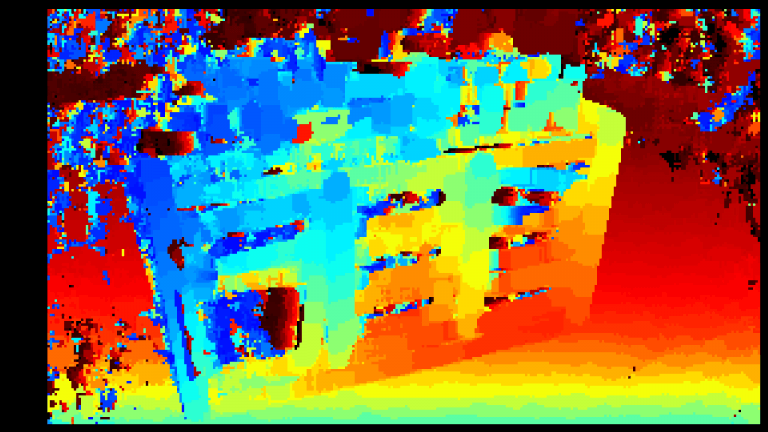 In this post, we’ll cover the basics of stereoscopic vision, including block-matching, calibration and rectification, depth from stereo using opencv, passive vs. active stereo, and relation to structured light. Regular consumer web-cams offer streams of RGB data within the visible spectrum that can be used for object recognition and tracking, as well as basic scene understanding. Identifying the exact dimensions of physical objects is still a challenge, even using machine learning. This is where depth cameras can help. Using a depth camera, you can add a brand‑new channel of information, with distance to every pixel. This new channel is used just like the others — for training and image processing, but also for measurement and scene reconstruction. The average running time of stereobm on an Intel(R) Core(TM) i5‑6600K CPU is around 110 ms offering effective 9 frames‑per‑second (FPS). The quality of the results you’ll get with this algorithm depends primarily on the density of visually distinguishable points (features) for the algorithm to match. Any source of texture — natural or artificial — will significantly improve the accuracy. That’s why it’s extremely useful to have an optional texture projector that can usually add details outside of the visible spectrum. In addition, you can use this projector as an artificial source of light for nighttime or dark situations. 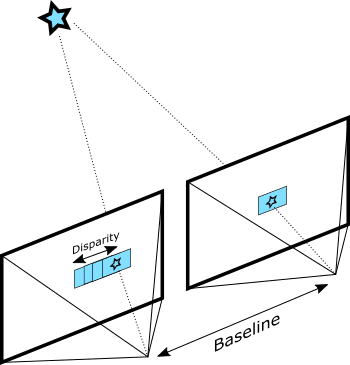 Left: opencv stereobm without projector. Right: stereobm with projector. Structured-Light is an alternative approach to depth from stereo. It relies on recognizing a specific projected pattern in a single image. For those interested in a structured‑light solution, there’s the Intel RealSense SR300 camera. Structured‑light solutions do offer certain benefits; however, they are fragile. Any external interference, from the sun or another structured‑light device, will prevent users from achieving any depth. In addition, because a laser projector must illuminate the entire scene, power consumption goes up with range, which often requires a dedicated power source. Depth from stereo on the other hand, only benefits from multi-camera setup and can be used with or without projector. 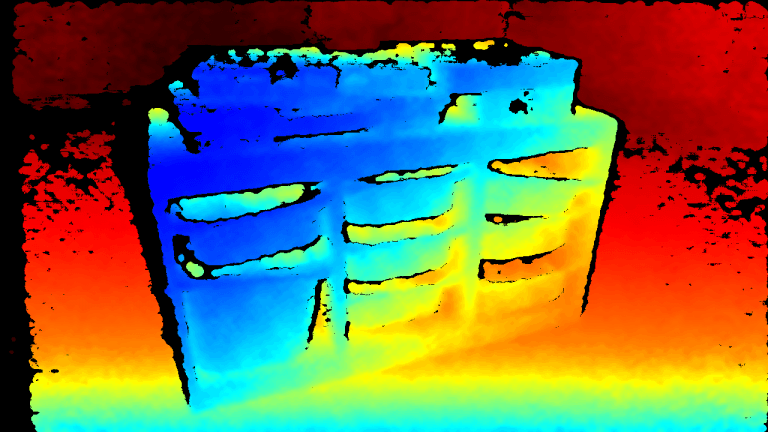 Just like opencv, Intel RealSense technology offers open‑source and cross‑platform set of APIs for getting depth data.